If you are looking to play an adventurous slot game powered by WMS software platform then you can choose Zeus God of Thunder slot. This slot has everything for players like you, who love to play adventurous slots. The game has action, a great playing environment and an awesome graphics. This slot game is of 5 reels and 30 paylines. You can play this slot using coin sizes of just 50 pence per spin to up to £500 per spin. This is a progressive slot game which has 4 bonus features in it. You will receive anything between 5 to 100 free spins while playing this great slot game at your place. 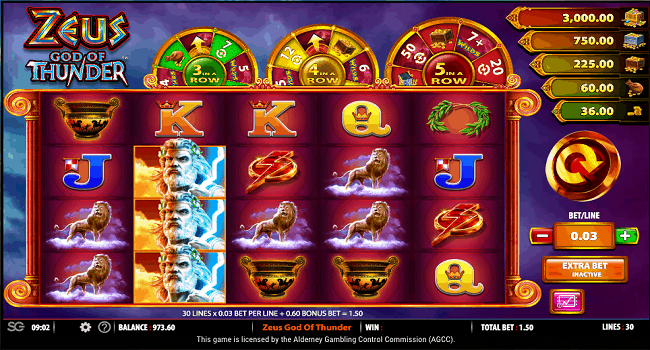 As the name suggest the slot is based on Greek mythology and about Greek God Zeus. You can play Zeus God of Thunder Slot at any WMS casino for real money using either your mobile phones, tables or your desktop. This is a highly popular slot game among players. In this game you can get up to 7 extra wilds for just 1 spin. The game includes symbols like playing cards, thunder bolts, Zeus himself, reels as well as goblets. There are 3 wheels located above the main reel set and they can be beneficial for you, if you select the extra bet option. Zeus God of Thunder slot is as excellent slot game from the house of WMS and with the option to get up to 100 free spins this is a highly recommended slot game. The free spin bonus feature is all about getting lots of free spins during your play. This feature can be triggered when you land 3 of the wheel across a payline. 3 wheels will offer you 7 free spins, 4 in a row will offer you 12 free spins and 5 symbols of the same wheel will offer you 50 free spins which can increased to up to 100 free spins. As mentioned, this is a progressive slot game which offers jackpots to the players. There are Mini, Minor and Major, Mega and Grand jackpot available in this game. If you hit 3 in a row wheel then you can win Mini and Minor Jackpots, while 4 in a row wheel can win you Minor and Major jackpots. The 5 in a row wheel can win Major, Mega and Grand jackpots for you. You can also trigger Wild Spin Bonus feature which would offer you great winning combinations.